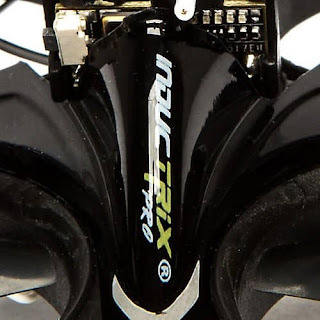 If you are used to the plain red Blade Inductrix or the Yellow FPV model, the black Blade Inductrix Pro racing quad sets up completly differently. When we set up our stealth black Inductrix Pro for the first time and bound it to our Specktrum DX9 Black Edition radio and nothing happened when the throttle stick was raised. We thought it was broken. The red LED was solid red so we knew it was communicating and binding was succesful but the motors never spun up. Our other two Inductrix Tiny Whoop quads which were built more for quad and FPV beginners, had a flight controller where the motors never needed to be armed. The Pro is different, it has a motor arming switch (H) which kills power to the motors when it is enabled. "Motors Disarmed" with the two position H switch pulled back towards you in position 1, the motors are off and it won't let it fly. This can also act as a failsafe so if you feel your quad is about to fly away or you lose control you can simply flip this switch back and all power to the motors will be cut and your Inductrix Pro will fall out of the sky. To recap with the switch closest to you, the motors are locked out and when disconnecting or reconnecting the battery they won't turn on when you apply throttle. "Motors Armed" As as soon as you push the H switch forward to position 0. The motors will only then be armed and be able to spin up when you push your throttle stick forward. This is a little bit tricky and can be a little confusing. If you leave the H switch in fly position (forward position 0) when you disconnect the battery. Then add another battery it will not spin up the motors until you arm the motors first by placing the switch in position 1 for a second or two and then pushing it forward away from you into position 0. Again, the Pro is a completely different animal than the other two Blade Inductrix Tiny Whoops. They are always ready to fly as soon as you insert the battery and apply the throttle stick. 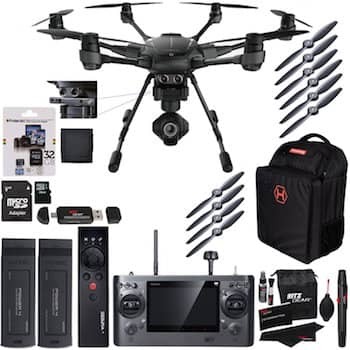 It's a small price to pay after you see how much better the Pro performs once you master arming it and flying it a few times. Anytime you need to instantly kill the motors like if it is flying out of range, just pull the arming switch back towards you and it will stop it dead in it's tracks. These tiny quads can auto rotate down from a very high distance with no damage. Just make sure you keep your eyes on it to see where they land. A tracking beeper would be nice that could activate with a switch. Although, where every gram counts it would no doubt affect performance. You may be able to locate it by spinning up the motors when it fell in some tall grass or thick brush. Hopefully you have enough juice left before the Flight Controller Low Voltage Cut-Off kicks in and shuts down your motors. 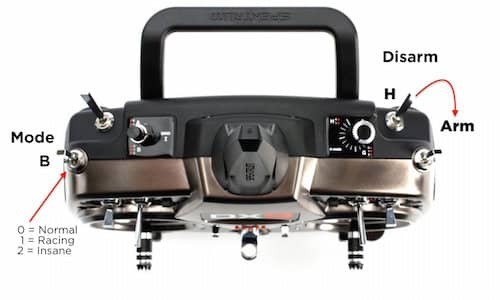 The Pro model also uses a three position Flight Mode Switch (B) 0, 1, 2. Position 0, bank angle is limited and it is self leveling. This is by far the easiest mode to fly in. Position 1, in this mode the motors never shut off and keep spinning at low RPMs. This make it easier to make turns and is typically used for racing. 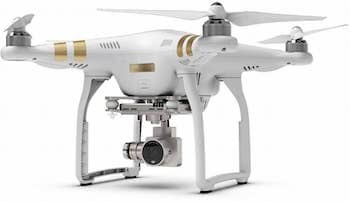 It will not self level and beginners, this makes the quad much harder to fly because it takes constant stick inputs to keep it level. Position 2, is just plain nuts. You will need to be an expert to fly in this mode. 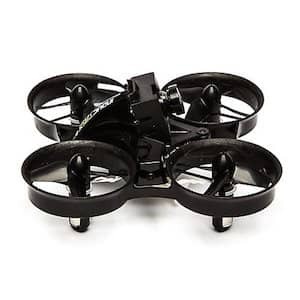 Inductrix quads are very hard to fly in this mode and if you are not very fast on the sticks, this is a good way to crash or lose your quad. When you first get you Inductrix and before you bind it you need to setup a new model in your Radio. Before you get started set all your trims to 0. If your throttle trim is set too high it may not arm. Use Airplane and not Quad mode. All Blade Inductrix use the Airplane setting per their customer support. Even though we were able setup both the Red Inductrix and the Yellow FPV Inductrix fine under their Quad Setting on our DX9 radio. The F3 flight controller comes pre-flashed and tuned with Betaflight firmware. Once you setup your radio to the settings listed here it flies fine. No need to go into the software and do any tweaking unless you like to tinker. These are the Inductrix Pro Radio Settings from the manual. Once all these setting have been set proceed with binding your Blade Inductrix Pro to your radio. To bind leave your radio off and power up your quad. Hold the bind button down until it says bind complete. The blinking red led should turn solid. Then proceed to arming your motors and get ready to put a big old smile on your face. Once you have your Pro setup and flying you will notice it is pretty darn quick especially if you previously had the yellow or red Inductrix without any mods. 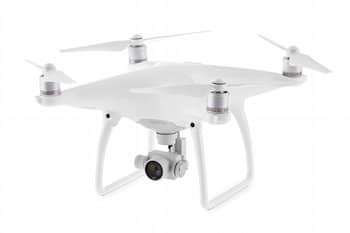 The Pro has more powerful motors and a lighter canopy. Even though the frame is a little heavier which is a nice tradeoff from the flimsy frame on the plain Inductrix and yellow Inductrix FPV. It also has a nicer camera. There is a slight occasional wobble which we all but eliminated by replacing the stock blades with these three bladed ones from Rakonheli. It also responded even better with the new blades. If this is your first Ultra Micro Quad and you just want to learn to fly, the Pro may be a little much, the yellow and red Inductrix quads are much easier to setup and fly. Although once you get the hang of the Flight mode and Arm switches the Pro will give you some great entertainment and you probably won't get bored. Be sure to get a handful of these batteries, because you will want to keep right on flying. More great Inductrix Tiny Whoop mods! I was able to bind the Inductrix FPV Pro with the MLP4DSM contontoller of the normal Inductrix FPV but the motors will not arm, can you help me? I haave a proto x fpv transmitter, how can i bind with a pro? I was able to connect my TBS Tango with a DSM2 Jbox with my Inductrix Pro, I get the video feed, but the only response I can get from the quad, is the white light turning on and off by the right 3 way switch. Make sure your mode switch is set to position zero and you went through the proper set up procedure. Sounds like your radio is not set up properly. Sounds like something did not get setup properly with your radio. Make sure your left "B" Switch is set to position 0 or it will be very hard to control. Also make sure you have your blades in the right spot. This happened to me when I got them reversed and even at full throttle it would barely lift off the ground. Matthew, make sure you go through the setup list and verify each setting is correct. If this radio is not setup correctly on your radio, nothing will happen. I have the same problem. Binds but doesn’t arm motors. Can get white light on it to work. Anybody? Did you flip your switch up and then back down? Read this part again "This is a little bit tricky and can be a little confusing. If you leave the H switch in fly position (forward position 0) when you disconnect the battery. Then add another battery it will not spin up the motors until you arm the motors first by placing the switch in position 1 for a second or two and then pushing it forward away from you into position 0." I have the DX7s, took some messing around but got it bound and flying. My issue is in the throttle setting. It will only show 150/100. I cannot get the second number to match the 150. All other settings I used and are fine. It seems a bit spongy/weak on the throttle and I assume this might be part of the problem?! Any advice? In your throttle screen at half throttle it should read zero. My Inductrix Pro is very responsive to the throttle. You may also want to check and make sure your blade pitch is also orientated in the same directions as shown in the photos posted. It's super easy to mix up your props and have them pointing the wrong way which will make your quad fly like doo do or not at all. I just got the inductrix pro and I have the DXe. I have tried several times binding it, making sure everything is at 0 and when I arm it and try to fly it does nothing. (But it works because when I press the panic botton it fly’s away) how do I fix this? Perfect Camera, Power and More. 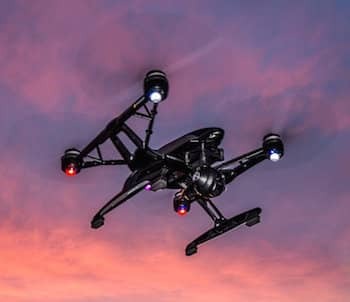 This Drone does it all. 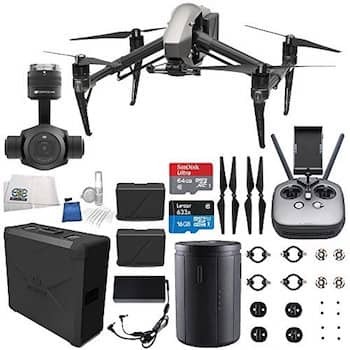 Your ultimate destination for finding and sharing the best drone mods, upgrades, tips and tricks. We want to help you get maximum enjoyment from this exciting and fun hobby.